Michael Murphy has a simple answer for Andy McEntee's suggestion that he holds influence over referees. "What do you say to it? 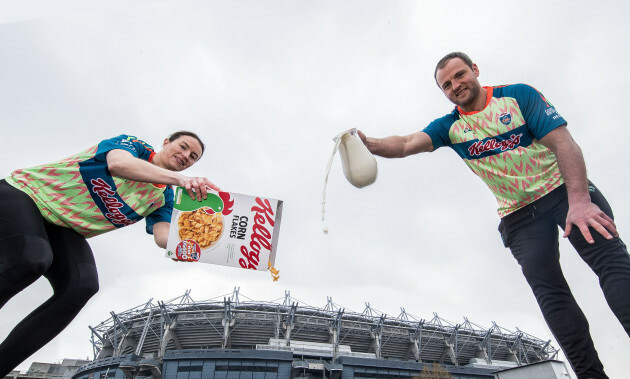 It wouldn't be a bad thing to have even though it's rubbish," said Murphy at the launch of the 2019 Kellogg's Cúl Camps. Meath manager McEntee made the suggestion following his side's two-point defeat to Murphy's Donegal in the National League Division 2 final earlier this month. "There's sometimes and some instances where you commit a foul and you get a yellow card but I'm in no place to influence anything," continued Murphy. "It’s the first time I’ve ever been asked about it in an interview or anything like that. It’s a difficult one to answer. "What else can you do [but block it out]? As a player, your job is to go out and play on the football field." Murphy was a late addition to the Donegal group during the National League, only returning to the fold midway through the campaign. He had spent those early weeks rehabbing his knee following surgery in January. "When I got back into things it was that fourth game in the National League and I was just glad to get a number of league games underneath the belt because it wasn't looking good at the start of January. "The speed of the National League now is gone through the roof. It's right up on par with what a championship game would be. It takes a little while longer [to get up to speed]. I'd hoped to be back a wee bit earlier in the league but the operation and recuperating from that took a wee while longer than normal. Touch wood everything's good at the moment." Overall, the Donegal joint-captain views the league campaign as a success. Young players were blooded and vital experience gained heading into the summer. "They're definitely not lacking ability," said Murphy, "we're very excited about them up in Donegal." One player in particular who caught the eye during that league final was 18-year-old Oisin Gallen. I must say he took to it really well," said Murphy, "he doesn't get too up or too down depending on performances. And more often than not, there's good days with Oisin. He's very good technically and understands the game very well. To see him out here in Croke Park kicking four points from play in a league final was huge for him and huge for us all to see. Fair dues to him and he's still young. There is also the return of Paddy McBreaty. The inside forward suffered a serious knee injury during last year's Ulster final against Fermanagh. "We played Patrick's club Kilcar on Sunday so it was brilliant for us all to see Patrick back. Obviously he suffered the dreaded cruciate and it's not a nice injury. He was at the peak of his powers last summer and was playing some really good stuff for us. We were disappointed to lose him coming into a crucial time of year but he's worked really hard to come back. "For us all to see him out on the pitch for the last month or two gave us all a lift. Knowing Patrick and being a teammate of his for the last number of years, I know he'll be mad hungry to get back out on the field and get the jersey back on and hit the form he had last year."